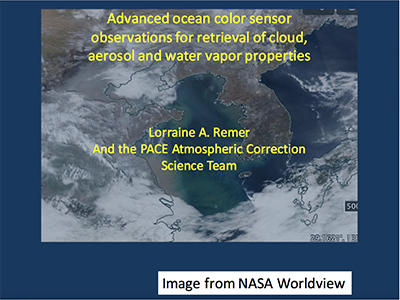 [26-Feb-16] While the next generation of ocean color sensors offers enhanced capability to retrieve ocean parameters and to advance ocean science, these sensors also offer enhanced capability for observing atmospheric parameters, as well. In particular advanced ocean color sensors are expected to broaden the spectral range to include bands from the UV to the SWIR, inclusive on a single instrument that will observe aquatic, terrestrial and atmospheric targets with the same geometry, same spatial resolution, and similar calibration strategies across the entire spectrum. This broad spectrum instrument is unprecedented, and unites atmospheric parameter retrieval algorithms from MODIS and OMI heritages, but for the first time providing UV data at moderate resolution and not the 13x24 km currently available from OMI. In addition the advanced ocean instruments will likely be hyperspectral, providing opportunity to apply retrieval techniques for aerosols, clouds and water vapor that have been developed for airborne spectrometers like AVIRIS, but now can be attempted from space. These spectral techniques are powerful and may overcome longstanding issues concerning aerosol and cloud layer height, gas corrections etc. Note, that the added capability of hyperspectral and broad spectrum imagers can push atmospheric science forward, over both land and ocean, and at the same time improve atmospheric correction over ocean. Credit: Remer, L.A..